California has SO MANY options when it comes to ultimate weekend getaways that sometimes it’s hard to choose where to go for your next trip. DON’T’ SWEAT IT, I got you! 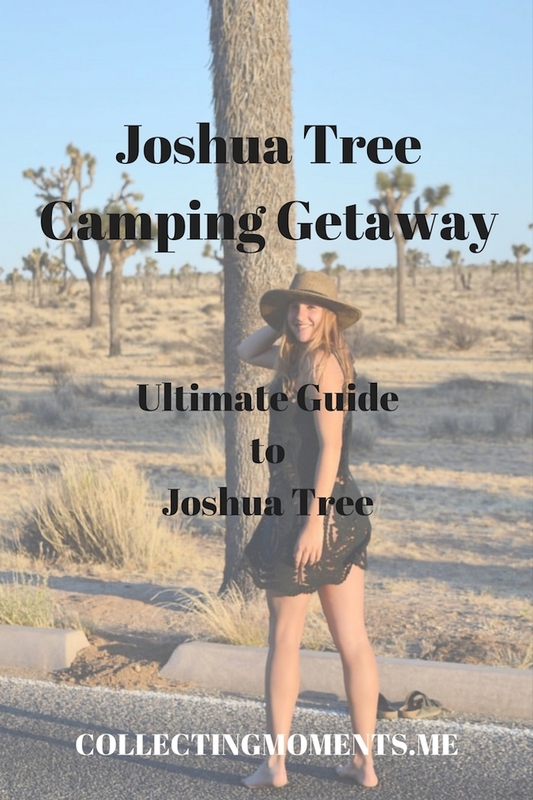 Joshua Tree National Park is your next destination. Joshua is an amazing haven when it comes to disconnecting from the daily hassle, and it’s conveniently located only a few hours away from L.A. The national park is filled with a mix of amazing rock formations, desert landscapes, hiking trails, and so many variations of Yucca trees; it’s the perfect set for all those Instagram pictures.. lol but so true! Guille and I decided to experience it all by going camping with our dog Papi, and it was such a unique and cool experience! Our three-day detox was much appreciated; disconnecting from technology and appreciating the little things is something everyone should try every once in while. (p.s. – THE BEST part is stargazing at nighttime!). Driving to Joshua Tree from L.A. was a very simple and easy ride. It took us about three hours to get there, and we got to see some nice scenery along the way. Also, there were plenty of rest stops and fast food chains, and even a few supermarkets before making it to the National Park entry. Once you enter the park though, there will be barely any/no cell service and there aren’t any stores nearby, so make sure to have all your essentials (WATER, WATER, WATER.) You can, of course, leave and re-enter the park as many times as you want and get anything you need, but the drive will be at least 20mins depending on which campground you’re staying in. The park entrance fee is $20 and is good for seven days. I had NEVER been camping before and after deciding we wanted to do something outdoors with our dog on our holiday weekend (Memorial Day weekend), we gave Joshua a try. It was a last minute decision, and it was so much fun! There are a few campgrounds to choose from (nine in total) and most are first-come, first-served all year round except for Black Rock and Indian Cove, which you can reserve up to six months in advance during the popular and busy season of Oct-May. We were lucky enough to find an incredible camping spot in Jumbo Rocks, and I say lucky because these campgrounds tend to fill up pretty quickly. So, make sure to get there as early as you can – I mean early Friday morning – if you want to secure a place to stay for the weekend. To pay for your campsite - Find an open/available spot and write the number down, then go back to the entrance, fill out the envelope with your car information, pay (cash only) a, and go back and display the receipt on the number stall. *Sidenote - There is no water at the Jumbo Rocks camping site, so pack more than enough! As I previously mentioned, we went for Memorial Day weekend and by that date it was already starting to get very hot by midday, so we would go on a walk in the early morning, hangout at our campsite for a bit, and around noon, we would drive around the national park and visit some of the most popular places nearby. Later on, we returned to our campsite to watch the incredible sunsets and enjoy each other’s company. Keys View: Amazing scenic view of the Coachella Valley and the San Andreas Fault. Skull Rock: Popular rock formation with similarity to a skull near the Jumbo Rocks campground. Pioneertown: We actually stopped on our way back home to L.A. and thought it was a cool pit stop. The town is an Old West motion picture set from the 1940s, built to allow the actors to live on the set while they were filming. There are a few shops and the famous restaurant/bar, Pappy and Harriet’s, which has live music most nights. 2) Go to a live performance at Pappy and Harriet’s – While we visited Pioneer town and saw the restaurant we didn’t actually get the opportunity to go at nighttime when it’s most popular.